Boidae is a family of nonvenomous snakes that includes the boa constrictor and anaconda. Most are found in America but some are in Africa, Europe, Asia and on some Pacific islands. 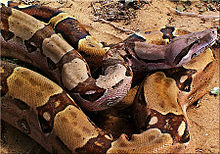 Their common names are boas or boids. Adults are medium to large in size, with females usually larger than the males. There are two subfamilies with eight genera and 43 species. ↑ 1.0 1.1 "Boidae". Integrated Taxonomic Information System. Retrieved 14 July 2008. This page was last changed on 2 July 2018, at 23:35.